Happy Friday everyone! I have a long list of “to-dos” so I thought I’d do a quick post of some things that are bringing me joy lately. Warm, soft and comfy socks. I found these super soft pair at Kohl’s and they are perfect to wear with my booties. Also while we were going through papers and re-arranging some items around the house last weekend I found my large cutting mat. I love this thing and can’t believe it was stored away with some other stuff. I have several cutting mats but this one is great as it covers quite a bit of space. Stickers! 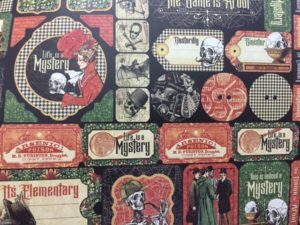 I found these super cute mystery themed stickers and I can’t wait to start using them in my reading journal, planner, whatever. Aren’t they cute? Speaking of crafting things, I know I recently mentioned drowning in paper but that didn’t stop me from buying several of the Michael’s Hot Buys paper packs and I also had a coupon so, yay for great bargains. Can’t wait to make more new journals. Last but certainly not least, looking forward to breakfast at a favorite place with a dear friend this weekend. I hope you have a fantastic weekend. Let me know what you are up to! Sounds like a great weekend, Iliana. Thanks for the link for the mystery stickers–I ordered some for my mail art! Kerbey Lane Cafe – yum! Love it! Happy weekend Iliana and happy crafting 🙂 Your cutting mat reminds me I need to buy a blocking board for my crochet. And those mystery stickers are really cute. I don’t trust myself at Michael’s lol. They have too many awesome things there and the yarns aisles <3 Enjoy your breakfast! I'm getting my hair cut later this morning and will probably take a nice scenic drive out this afternoon, the temps are getting up to 50 by me. I’ve got my warm comfy socks on today (although not the same kind you have). 🙂 I love this post! I hope you are enjoying your weekend. Jenclair – I’m so glad you got some. I just found out that there are some new ones coming out with a “Little Women” theme. Oh no, I’m going to want those too. Haha. Joann@Lakeside Musing – I know right? A must for winter! Lark – I hope you were able to enjoy your free day and hurrah for days off! Kay – Isn’t it a great place? Also another favorite is Magnolia Cafe but I tend to go to Kerbey Lane more often. Bookworm – Michael’s is dangerous isn’t it? I get their daily emails and as soon as I see one I’m like I need something! haha. Saw your beautiful infinity scarf and can’t wait to see what you make with the new pattern book! Kailana – No kidding right? The worst part about this is that I had forgotten the mat. Ugh. thank goodness I didn’t buy another one and now it’s back where it belongs in the studio! Kerby Lane looks like a great restaurant. They had me at Fried Avocado Tacos!! Yum! Remind me of this place when I mention that we’re heading to Texas, ok? !